The full Bodyweight Beatdown Workout is available at www.GregPlitt.com. The GregPlitt.com Members Section contains over 250 hours of video, including 66 instructional workout videos, $9.95 a month for full access. The full Gun Blast Workout is available at www.GregPlitt.com. The colors of his shorts are gorgeous, but they are easily surpassed by his stunningly ripped beach body. 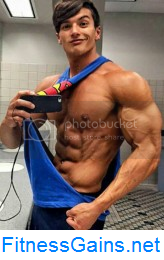 Austin C. is a bodybuilder and fitness model who recently was discovered while in the gym. He is attending college and hopes to one day make a name for himself in the fitness and modeling worlds. His hobbies include working out, listening to music and cooking. You find many high quality photos and videos of Austin C. here on AllAmericanGuys. The full C-Block Workout is available at www.GregPlitt.com. The full Push Performance Workout is available at www.GregPlitt.com.